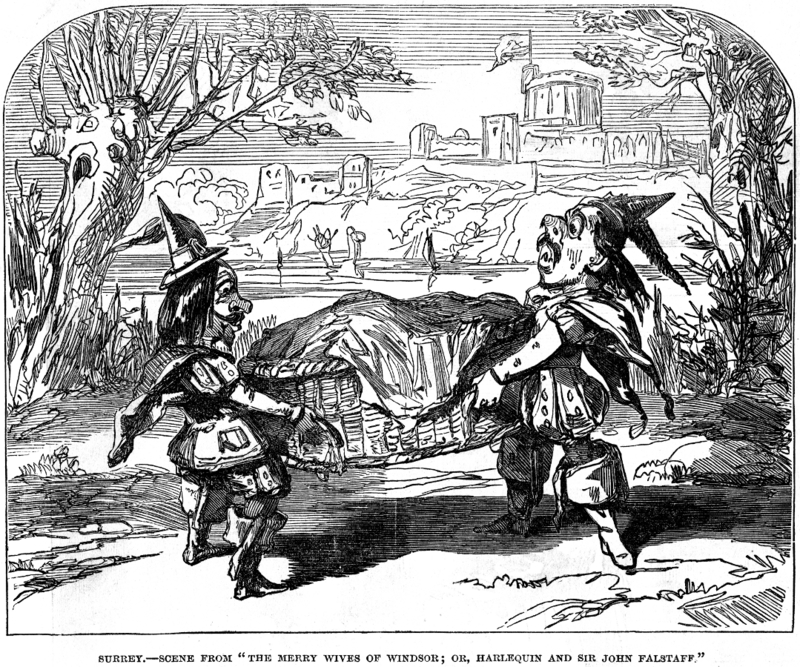 The Merry Wives of Windsor; or, Harlequin and Sir John Falstaff a Harlequinaded version. 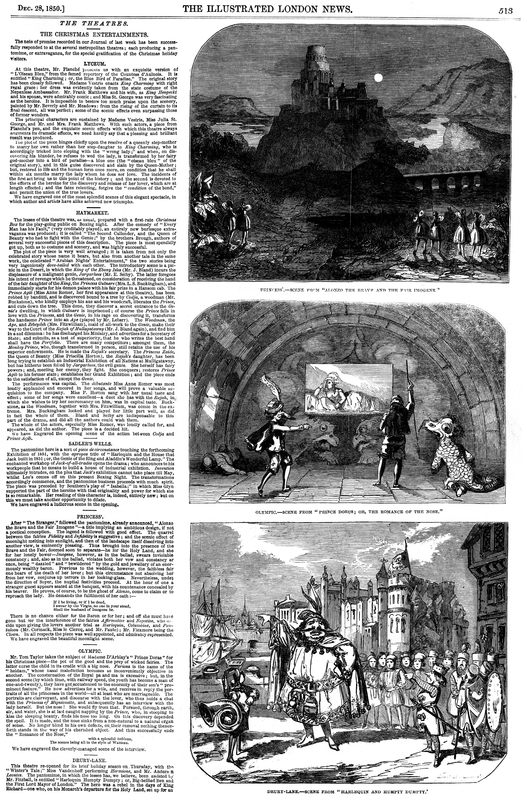 This transpontine theatre has turned "The Merry Wives of Windsor" into a harlequinade. 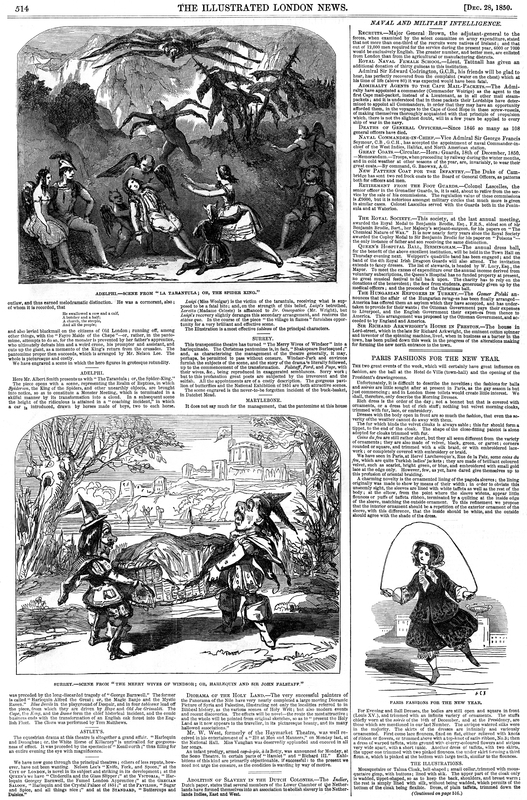 The Christmas pantomime is, in fact, "Shakspeare [sic] Burlesqued;" and, as characterising the management of the theatre generally, it may, perhaps, be permitted to pass without censure. Windsor-Park and environs furnish the subjects of the scene, and the story of the drama is literally followed up to the commencement of the transformation. Falstaff, Ford, and Page, with their wives, &c., being reproduced in exaggerated semblances. Sorry work; but to this profanation great poets are subjected by the irreverent and the selfish. All the appointments are of a costly description. The gorgeous pavilion of butterflies and the National Exhibition of 1851 are both attractive scenes. The scene engraved is the never-to-be forgotten incident of the buck-basket in Datchet Mead.